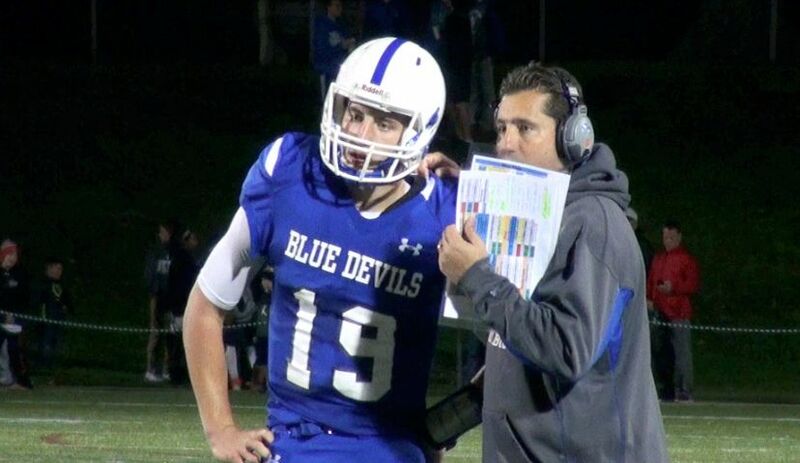 Leominster coach Dave Palazzi (right) moved senior Noah Gray (left) from quarterback to wide receiver last week, and the move paid off instantly. For the most part, the top teams in the region stood tall last weekend, but there was still some drama, and a bit of shakeup in our Top 10. Check out our updated Power Rankings below. 1. St. John's (Shrewsbury): 4-1. Division 2. Last Week: Ranked No. 1, defeated No. 8 Shrewsbury 38-35. Junior quarterback Steve Bucciaglia both threw and rushed for two touchdowns, including the game-winning rushing score with a minute left. Bucciaglia's heroics came all in the second half, and erased a 21-8 halftime deficit against crosstown rival Shrewsbury. 2. Wachusett: 5-0, 2-0 Mid-Wach A. Division 2. Last Week: Ranked No. 2, defeated Doherty 35-8. The deepest and most diverse backfield in CMass continued to impress, as four different players scored rushing touchdowns for Wachusett in a blowout of Doherty. The Mountaineers have shown they can run it down pretty much anybody's throat, and defend with the best of them. We'll be treated to a No. 1 vs No. 2 clash Saturday afternoon when Wachusett travels to St. John's. 3. Grafton: 5-0, 2-0 SWCL A. Division 3. Last Week: Ranked No. 3, defeated Northbridge 7-0. The Indians got a bit of a scare from old rival Northbridge, as somebody was finally able to slow down Grafton's Ifeatu Melifonwu on the ground. But, the Indians proved their worth on defense, pitching their second consecutive shutout, and they still haven't surrendered more than eight points all season. A trip to Tantasqua awaits Grafton Friday night. 4. Auburn: 5-0, 2-0 SWCL A. Division 3. Last Week: Ranked No. 4, defeated Uxbridge 21-20. Like Grafton, Auburn also received a scare from a league foe. The Rockets needed a touchdown run from senior quarterback Steve Saucier with less than 10 seconds to play to top the Spartans. Saucier also threw two other touchdown passes on the night, and the Rockets held Uxbridge's explosive offense in check, for the most part. Even if it was a missed Spartans extra point that allowed Auburn to win and not tie with its final score, you have to like the Rockets' grit, and ability to win close games against good competition. Auburn will be tested again Friday night against old nemesis Northbridge. 5. Leominster: 3-2, 1-1 Mid-Wach A. Division 2. Last Week: Ranked No. 5, defeated No. 6 Algonquin 33-14. The Blue Devils may have been playing for their season last week, and coach Dave Palazzi made a big change to an offense that had stalled the past two weeks. Palazzi moved star quarterback Noah Gray to wide receiver, a role he's more than comfortable with (he's committed to Duke as a tight end), and the senior delivered. A. Allows him to get more comfortable catching the ball before he heads to Duke. B. Gives the Blue Devils, instantly, one of the best downfield weapons in the state. D. Allows Leominster to play Gray both sides of the ball more frequently, and not dwell on each offensive series. Friday night brings another huge test, as the Blue Devils host another offense finding its rhythm- Shepherd Hill. 6. Nashoba: 3-2, 2-0 Mid-Wach B. Division 2A. Last Week: Ranked No. 7, defeated Fitchburg 42-7. The Chieftains look like every bit the physical powerhouse they were a season ago, dominating both on the ground offensively, and up front on defense. Nashoba made short work of league foe Fitchburg last week, and moves onto what should be the game of the year in Mid-Wach B and Division 2A, at Marlboro. 7. Shrewsbury: 3-2, 1-0 Mid-Wach A. Division 2. Last Week: Ranked No. 8, lost to No. 1 St. John's 38-35. Yes, I moved the Colonials up a spot, even in defeat. Say what you want about that, but I think we can all agree that Shrewsbury playing St. John's down to the wire was as impressive a result as there was across the region, and it was the game that FINALLY proved to me this team is for real. Yes, they beat Shepherd Hill during the Kevin Mensah controversy, and yes they took care of Fitchburg and edged Marlboro, but putting 35 points on a defense as talented as St. John's really shows something. We'll get a chance to see if they can really compete for the Mid-Wach A crown, and a playoff spot, when they host Algonquin Friday night. 8. Maynard: 5-0, 4-0 Mid-Wach D. Division 4A. Last Week: Ranked No. 9, defeated Narragansett 30-7. The Tigers continued to dominate, behind the all-around exploits of P.J. Falzone, and the defensive excellence of Eric Kiley, who recorded 19 tackles… I'll repeat that: 19 TACKLES, and an interception in a blowout of Narragansett. Things get much tougher this week, as Maynard hosts UMass commit Cole McCubrey and West Boylston Friday night. 9. Algonquin: 3-2, 0-2 Mid-Wach A. Division 2. Last Week: Ranked No. 6, lost to No. 5 Leominster 33-14. Algonquin has failed to knock off Mid-Wach powers Shepherd Hill and Leominster the past two weeks, but the T-Hawks still have a chance to save their season Friday night at rival Shrewsbury. This is the week we find out if Week 1's win over Nashoba was just a fluke, or a sign that this program is ready to take the next step and compete with the best in Central Mass. A loss Friday would be devastating for an Algonquin team that has to play Wachusett and St. John's the next two weeks. The good news? Because of the brutal next three games, the T-Hawks pretty much control their own destiny. 10. Nipmuc: 4-1, 2-0 Dual Valley. Division 3A. Last Week: Unranked, defeated No. 10 St. Bernard's 24-0. Well, we had the Bernardians in this spot last week, and the Warriors did run roughshod over them Friday night, so it only makes sense that Nipmuc rounds out the Top 10 this week. Don't look now, but Nipmuc has won three in a row, and heads into Friday night's game at Sutton with a chance to lock up the Dual Valley title, and a playoff spot in Division 3A. What a great start for the Grafton Indians! Also finally in the correctly positioned division for post season play with the new MIAA alignment. (Wait am I extolling the virtues of the Grafton athletic prowess too much?) hard work pays off.